After a successful number of rallies including a Lancer GSR 1600 1-2-3-4 finish in the Safari Rally, Mitsubishi took three years away from the WRC to develop the Lancer 2000 Turbo. 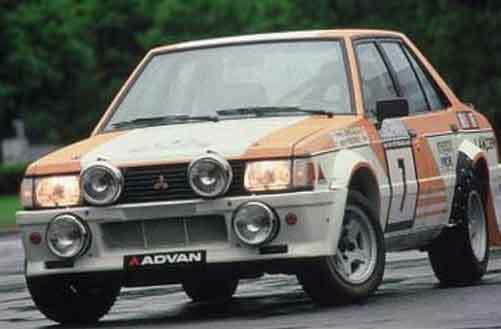 Mitsubishi and its Austria Distributor Denzel AG jointly developed the Lancer 2000 Rally Turbo as a Group 4 car. With the help of Andrew Cowan and Ralliart the Lancer 2000 Turbo was prepared to compete as a Group B car. The turbocharged Lancer fully utilized the light, highly rigid non-turbo Lancer body boasting its turbocharged power plant and heavy-duty suspension resulting in very high performance and stability. Rally cars were modified for the task. A close ratio 5 speed transmission was fitted and the rear gear ratios were changed to 4.62:1. A limited slip differential was incorporated in the rear axle as well. The light weight alloy, extra wide wheels were enclosed within special wheelarch extensions. Both the front and rear suspension systems incorporated gas/oil filled shock absorber units. The normal production Lancer 2000 Turbo was equipped with halogen headlamps and, as the WRC has many stages in darkness, four additional halogen lamps were fitted to each rally car. Under-body protection was increased by the addition of light-weight alloy shield which covered the underside of the engine and gearbox. Based on the rear wheel drive Mitsubishi flagship, the Starion, the Starion 4WD set out with the goal of winning in group B. 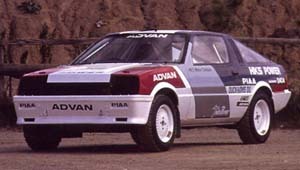 It was a 4WD, 350 horsepower version of the Mitsubishi Starion, being developed for group B international competition by Andrew Cowan’s British-based Ralliart Team. The team included Alan Wilkinson — an engineer whose rallying credentials are second to none. He came to Team Ralliart via Ford’s competition department, Toyota Team Europe and Audi Sport UK, where he was responsible for their very successful Quattro. 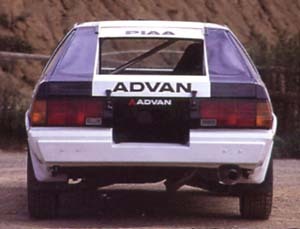 The mechanical specification of the Starion 4WD Rally were very much a large part of Alan Wilkinson’s job, to develop a competition configuration for the car that can then be used for the 20 evolutionary models the company needed to build to gain Group B homologation. With permanent four-wheel-drive and a 2-litre turbocharged engine, the Starion Rally is a very far cry from the old Lancers. Official Group B homologation of the Starion Rally would have come in time for the team to make its debut in world championship rallying with a two car entry on the 1986 Lombard RAC Rally in November. Homologation never occured after it was announced that the 1986 season would be the last for Group B. During its early development the Starion used a version of Mitsubishi’s two-litre turbo engine, with intercooler and computer controlled fuel injection system. But the goal was 350hp using the Sirius Dash engine that Mitsubishi announced at the 1983 Tokyo motor show. 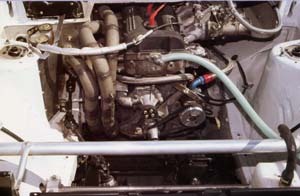 This engine featured a special three valves per cylinder head with two inlet valves for each cylinder—one operates all the time and the other is electronically controlled to come into operation only over 2500rpm. It is said to provide good top end performance without having to sacrifice power at the lower end of the rev range. Fuel injection was handled by a Bosch EFI computer. The turbocharger is of unknown size but was manufactured by Mitusbishi Heavey Industries. Power is transfered through a twin plate clutch to the same 5 speed transmission as the RWD Starion, but with stonger internals and a transfer case from the Pajero. This takes the drive sideways to a second propshaft that goes forwards to the front wheels: torque is permanently 50% / 50% front/rear. It would have required considerable effort to design an alternate system for what is regarded as only the marginal benefits of adjustable torque split. The front axel line runs under number two cylinder. This results in the engine sitting higher in the chassis, but it would create insuperable problems to move the power unit significantly further back. This resulted in the crank centerline being about 6 degrees from the horizontal. The project had been conceived as a converted RWD car and the was still front-end heavy. It runs on the same, 96″ wheelbase as the standard car but, overall, it is nearly 6″ shorter. The most visible change to the chassis was to shorten the front overhang, a simple operation because new, lightweight front panels had to be designed in any case. The flip up headlights were replaced by more traditional sealed beam units. Getting the weight down to a minimum has been an important objective in the Starion’s design and as a result the car uses carbon-fibre reinforced plastics for the propshafts, sumpguard and lower control arms of the McPherson strut suspension. Virtually all the exterior body panels are in glass-fibre and plastic (Carbon & Kevlar on Evolution models): bonnet, tailgate, door skins, wings, bumpers and spoilers. The resulting weight was around 1050 kgs. The D class cars resembled their road going bases by little more than name. The rules were open to pretty much anything (other than a few safety and siloette details). The result was that competing cars were all very extreme with high power engines and 4WD to put that power to the dirt. In today’s world it is not hard to find an innexpensive 4WD car to go racing, but in the early 80s, 4WD competition cars were very rare such as the Audi Quattro and Puegot 205 T16. Furthermore all the parts of a 4WD systems were very expensive and almost inaccessible to racers outside of the factory teams. It was HKS’s plan to convert an existing vehicle to 4WD. The 1980s equivalent of the local race shop building an F1 car. The body work of the HKS D404 is similar to Mitsubishi’s version, the front overhang has been cut down 30cm and the body panels are mostly made of composits. Also, the glass windows have been replaced with acrylic. The result of all this “added lightness” is a gross weight, including 30 liters of fuel, of only 920kg. This is pretty amazing considering that the Mitsubishi factory built rally car weighed in at 960kg. The “HKS134E” engine was based on the G54B engine found in many of the Starions that were produced. The insides differ greatly from those of the stock engine. The engine has been destroked from 98mm to 88mm resulting in a 2314cc of displacement. HKS also made their own custom forged pistons for the engine. The head is made by HKS as well and is DOHC with 16 valves. The engine was non-turbo and carburated making 276hp @ 7000rpm and 195 ft/lbs @ 5500rpm. This resulted in a high reving rotary like power band. The transmission is a Starion gearbox with power diverted to the front via a Pajero transfer case. 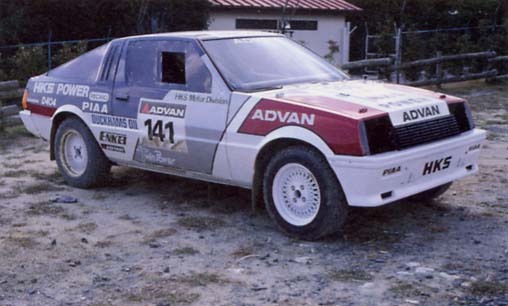 This is used because the road car was only available in RWD and the full-time 4WD transmission did not exist anywhere other on than the Group B prototypes. The HKS car could switch between RWD and 4WD via a lever on the transfer case. In addition, the LSD was installed in the rear differential, but not in the front. The Starion was originally a FR car, for 4WD conversion the front axle and drive system are substantially modified. The engine was moved back to within the wheelbase for better weight balance and for fitment of a front differnetial. In addition to these modifications, the front suspension was modified to fit a Fuji Heavy Industries steering rack in front of the crossmember to elimiate the cumbersome stock steering box. The suspension consisted of 4 wheel independent suspension to better handling and simplicity at each corner. The rear suspension is basically stock with KYB struts and reinforced strut tops and bushings. From this picture we can see that the engine sits “front-midship”. Front-Midship is when the engine sits entirely behind the front axel. Using the strut tower as a reference, you understand how far the engine is moved back. The plane of the firewall runs through cylinder 2! In addition, the radiator is moved to the rear and uses and electric fan. The front grille and the air dam bumper of the A175 Lancer EX turbo are installed on the front which is cut down. Also, the tire size on the front and rear is 195/70SR15. The wheels are from the 2000 GSR-VR Enkei mesh and are 6.5″ wide.